I have done almost as many paellas in my life as I have hair on my head.....and given that my hair line is receding, I am hopeful that the number of paellas will soon surpass! ​"When I was 2 months old, my parents moved from our native Germany to Spain where I ended up living for the next 15 years. 8 in Barcelona, 7 in Madrid. Paellas were a staple at most of our parties when it came to food. I learned how to make it from the locals and also from my mother's kitchen staff, Mapi and Amparo. I considered them my two grandmas. They lived with our family for 15 years and taught me everything there is to know about paella and cooking it the traditional way. When I immigrated to the U.S. in 2001, I arrived in New York City with nothing more than a suitcase and our family Paella Pan. My mother gave it to me as a parting gift for my new adventure. At the time, I thought it was weird, yet who would have known that today it would lead to this. Thank you, mom. It all started much differently. After obtaining a BA in Finance & Accounting, I started working as an accountant for one of the most prestigious law firms in the nation. As a hobby, I cooked Paellas on a monthly basis for friends. Over the years, my mom kept bugging me with the notion of starting a Paella Business. I told her I was an accountant now, mom...not a chef! Eventually, I noticed that my Paellas were better than many I had elsewhere in SoCAL and decided to take matters into my own hand. I had to rescue my fellow people from bad or mediocre paellas." 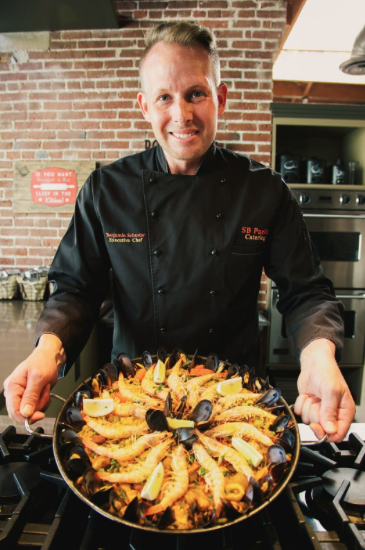 We are the only professional, fully licensed and registered Paella and Tapas Catering Business in Santa Barbara. We are ranked the highest in customer satisfaction, food quality and service. Aside from private events, we dedicate our time to donating 100% of our food and services, supporting non-profits we choose and feel passionate about. Past recipients of our services where the SB Rescue Mission, the Women Shelter for Domestic Violence and the Teddy Bear Cancer Foundation...just to name a few. We make this event about you and your guests. Our food & service will merely culminate it. We want to be your partner, the ones that care just as much about the event as you do. It is our mission to ensure that this experience will last a lifetime. With only the very best ingredients, local meats and seafood, and paella made FRESH the day of your event, you're about about to embark on a trip to Spain, its traditions and beautiful food culture. You have been deprived of the real paella for a long time. It is time to step up and throw it down. Only the best get to plan a Paella Party.